Nagasaki. Laid down at Mitsubishi Zosen K. K. as Yard No. 329, a 7,148-ton passenger-cargo ship for Nippon Yusen Kaisha (NYK), K. K. (Japan Mail Steamship Co.) of Tokyo. Launched and named DELAGOA MARU. Completed and placed on NYK's Japan ~ Hamburg, Germany route. Arrives at Cristobal Colón, Panama. Departs Singapore for Liverpool, England. Requisitioned by the Imperial Army (IJA) and allotted Army No. 620.. Released by the IJA by that same day, re-requisitioned by the IJA. At 0830, departs Camranh Bay in the IJA 5th Infantry Division Transportation Movement's 2nd landing. DELAGOA MARU is in TransDiv1 with KAMO, KUWAYAMA, MACASSAR, ORIDONO and SAMARAN MARUs. The Movement carries the main body of the 5th Infantry Division. At 1900, arrives at Singora, Siam (now Songhkla, Thailand). DELAGOA MARU departs Mako for Sasebo in convoy No. 220 also consisting of DAISHO,, RYUWA, SHINYO and YAMAGATA MARUs and seven unidentified merchant ships escorted by minesweeper W-1. DELAGOA MARU departs Mutsure in convoy No. 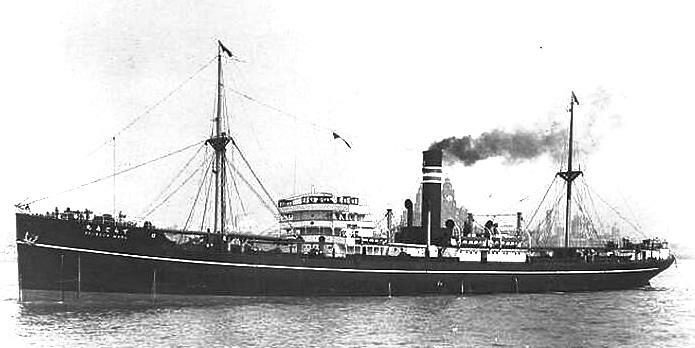 141 also consisting of YAMAGATA and two unidentified merchant ships escorted by destroyer WAKATAKE. At 0730, DELAGOA MARU departs Rabaul in a convoy also consisting of BRAZIL, CHIFUKU, CLYDE, FUKOKU, FUKUYO, INDIA and UCHIDE MARUs escorted by minesweepers W-17 and W-21. At 0900, LtCdr (later Cdr/MOH, posthumously) Howard W. Gilmore's (USNA ’26) USS GROWLER (SS-215) attacks the convoy and torpedoes and sinks CHIFUKU MARU at 04-03N, 151-55E. One crewman is KIA. At 0545, DELAGOA MARU departs Palau in convoy TO-906 also consisting of DAINICHI, KAZAN, MACASSAR, SAN FRANCISCO MARUs and EIKO MARU No. 2 GO, escorted by patrol boat PB-46 and minesweeper W-17. W-17 is detached at latitude 10N. At 30-40N 134-50E, minelayers YURIJIMA and NUWAJIMA join convoy TO-906 as additional escorts. At 1920, arrives at Saeki. At 0900, DELAGOA MARU departs Saeki for Palau in convoy No. O-003 also consisting of TAISHO and TOYOKAWA MARUs escorted by patrol boat PB-31, minelayer YURISHIMA and auxiliary minesweepers TAKUNAN MARU No. 3 YURISHIMA and TAKUNAN MARU No. 3. At 29N, the escorts are detached. At 1030, DELAGOA MARU departs Palau escorting convoy FU-706 consisting of TAISHO, SHINKO, NICHIRYO and TOHO MARUs and EIKO MARU No. 2 GO escorted by kaibokan IKI. At 30-50N, 133-50E, auxiliary minesweepers AOI, KOZAN, YACHIYO MARUs, TOKUHO MARU No. 10 and auxiliary patrol boats MATO MARU and MYOGEN MARU No. 16 join the convoy. DELAGOA MARU departs Takao escorting convoy No. 771 consisting of ASAKA, HOFUKU and ROKKO MARUs and two unidentified merchant ships escorted by destroyer WAKATAKE. At 0600, DELAGOA MARU departs Saeki for Palau in convoy O-112 also consisting of EHIME, CHIHAYA, HOZUGAWA, KANJO, MOJI, NICHIAI, TENCHO, UME, UMEKAWA, YAMAGATA and YAWATA MARUs. escorted by minesweepers W-18 and W-17, auxiliary minesweepers TAKUNAN MARU No. 3, TOKUHO MARU No. 10 and AOI MARU and auxiliary subchasers TAKUNAN MARU No. 8 and CHIYO MARU No. 8. DELAGOA MARU carries the 248th Air Regiment (Fighters). That night, the convoy is attacked by LtCdr (later Captain) Robert E. Dornin's (USNA ’35) USS TRIGGER (SS-237). Dornin claims two sinkings, but actually scores no hits. The escorts counterattack, but are also unsuccessful. At 0048, LtCdr (later Captain) Slade D. Cutter's (USNA ’35) USS SEAHORSE (SS-304) torpedoes and sinks YAWATA MARU at 28-20N, 135-20E. Four gunners and 64 crew are KIA. At 0215, TRIGGER attacks the convoy again. Dornin fires three torpedoes. All hit and sink DELAGOA MARU near Tanegashima at 28-30N, 135-35E. She was carrying 206 maintenance and supply men of the 248th Air Regiment. The unit was equipped with Nakajima Type 1 "Hayabusa" (Oscar) IJA fighters. 201 of its men are KIA, as are 12 Army civilians, seven gunners and 68 crewmen.